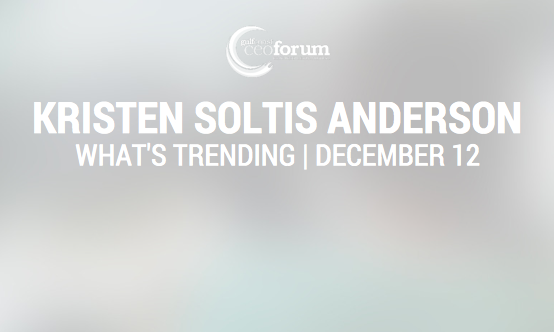 Kristen Soltis Anderson is a Partner and Co-Founder of the Washington, D.C.-based Echelon Insights, a research, analytics, and digital intelligence firm. Anderson also served as a Resident Fellow at Harvard University’s Institute of Politics in 2014. She previously served as Vice President of The Winston Group, a Washington DC-based opinion research and political communications firm where she spent eight years studying emerging trends in politics and policy. Her research on millennial attitudes has been featured in The New York Times Magazine and she regularly speaks to audiences of corporate leaders and public officials about how to reach the millennial generation. Currently, Anderson serves as a political columnist for The Washington Examiner and as a contributor for ABC News. She also co-hosts a podcast, The Pollsters, with Margie Omero. Anderson regularly appears on programs such as NBC’s Meet The Press, ABC’s This Week, CNN’s State of the Union, and HBO’s Real Time with Bill Maher. Anderson has a Master’s in Government from Johns Hopkins University, and a Bachelor’s in Political Science from the University of Florida. She resides in Washington with her husband, Chris.